Michael Czarnecki is a poet, oral memoirist and owner/publisher of FootHills Publishing, a family-run business that produces beautifully hand-crafted chapbooks and full-length collections. He teaches community workshops, presents as visiting lecturer at the college level, and served as a Poet-in-Residence in K-12 schools for 15 years. 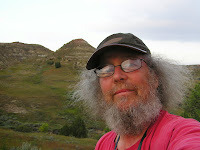 He is the author of Wheeler Hill (Benevolent Bird Press); The Acadia Cycle (Simpatico Poets Press); Zoo Haiku (Paper Kite Press); Never Stop Asking for Poems, Selected Work; Twenty Days on Route 20; Sea Smoke and Sand Dollars; Simple Life, Simple Poems (FootHills); and is a contributor to In the Spirit of T’ao Ch’ien, Charles Rossiter, Editor (FootHills). In August Czarnecki set out on a 96-day poetic journey appropriately named “Poems Across America.” While this is not his first road trip to read and discuss poetry, it is the first one during which he will offer a reading in each of the contiguous 48 states. Part of this interview was conducted via phone while Michael was sitting in a rest area along I-84 on the way to his reading at the Prosser Library in Bloomfield, Connecticut. The remaining questions he answered via email while in Devil’s Lake State Park, Wisconsin. DL: What was the impetus for this project? On the FootHills Publishing web site, you said it was first hatched nine years ago, but what made you choose summer/fall 2013? MC: I have done poetic cross-country journeys in the past, and nine years ago I was in Seal Harbor, Maine and thinking about what states I had not yet read in, and I thought, why not do a whole country tour? But, there was no right time in the in-between years. Nine years ago, we had also just built our house in upstate New York, which burned down in 2012. Subconsciously, it goes back to losing the house and our possessions and realizing that we aren’t guaranteed anything and how precious time is. How do you fund an endeavor such as this? Booking paid readings was a criteria for this tour. While I am doing a few benefit readings, I will be receiving an honorarium for most. Some friends asked how they could help; they wanted to make sure the trip happened. We had done an Indiegogo campaign after our house fire that was successful, so I decided to do another one for this project. I raised $2,700 mostly through the campaign. Each person who donated receives handwritten haiku postcards from the road. Also, I’ve been bartering for rooms along the way. I started doing this on my first US 20 journey in 1996. I mention that at readings if I don’t have a place to stay yet and tell people I’ll exchange books for a couch or bed for the night. I’ve met some wonderful people that way. It would be unaffordable for me to stay in motels all the time, when I wasn’t camping that is. How are you choosing venues? I started with calling public libraries. An important part of the journey is about connecting with old friends and making new ones. Making calls led to an unexpected conversation with a non-poetry group (a community garden group) in New Jersey where I read at an 1809 grist mill in August. In Maine, I stayed with a friend whom I haven’t seen since 1986, and met a couple from Delaware who invited me to stay with them when I am there. That ended up being a wonderful three day visit. In Flagstaff, Arizona, I will be staying with a friend I haven’t seen since 1981. In Puget Sound, I will meet a Foothills poet who I have never met in person before. In Maryland, I read at a library near the mouth of the Susquehanna River. I always wanted to go to the place where the water runs to from my 50 acres in New York state. Do you have a pre-determined “set list” for each reading or are you taking a more organic approach? I generally take a more organic approach in determining what to read or recite at a reading. I don’t give it a whole lot of thought ahead of time, but rather make decisions about what to read in the time before the reading when socializing with the audience, either just before or if we meet for a meal ahead of time. There’s a few poems that are always a possibility to be read: “Ginseng Hunter,” “Liberty Street Poetry Reading, Bath, NY,” “The Echo of What Has Passed.” But beyond those, it’s pretty fluid and not planned out. to never stop asking for poems. Can you talk a bit about your poetry? Where does it come from? How do you view it? Is it rooted in a certain poetic school of thought/movement? Are you influenced by any particular poets- past or present? First off, the influences, somewhat in order, starting from way back. Robert Frost (always carried him with me in the old hitchhiking days through New England,) Robinson Jeffers, Gary Snyder, Matsuo Basho, T’ao Ch’ien, Lew Welch, Li Bai, Su Tung-Po, Ryokan and then countless other Chinese poets. I think that line of poetic influences certainly can lead one into having a sense of my poetry even if they have never read my work. The poems come from the life. There is no separation between the poet, the person, the life. The natural world is a big source of the inspiration, but also many poems come from interactions with people. Somewhat connected to this is the way I have viewed, for the last three decades or so, the foundation that underpins my life. I see it as a triangle, the three sides being nature, creativity, human relationships. Often the triangle is irregular, with one side a bit shorter than the others. Sometimes I’m too much the recluse, sometimes too people oriented, sometimes, even from where I live on Wheeler Hill, I don’t get out into the natural world enough, sometimes I’m not writing enough. The aim is balance, an equilateral triangle. When it is more balanced, it seems the poems come to me more frequently. Who do you like reading and what reading material have you brought along on the journey? I still read most of the poetic influences mentioned above. Beyond that, it’s quite varied. As the publisher of FootHills Publishing, I read a lot of FootHills poets naturally. As far as books that I have brought along: Turtle Island by Snyder, Selected Poems of T’ao Ch’ien translated by David Hinton, Lew Welch’s Ring of Bone, books by Li Bai, Basho, Ryokan, Kawabata’s Palm of the Hand Stories and various nature guides. In actuality, I have been so busy on this journey that there has been very little time available for reading. What other activities/sightseeing do you have planned for each of your stops? Not too much planned ahead of time. I like to be spontaneous and, if not planned ahead of time to stay with a friend, I usually don’t know where I’ll be spending the night till that evening. I often barter for a place to stay, exchanging books for a couch or bed. I meet some wonderful people that way it connects me back to the old hitchhiking days when I thumbed about 30,000 miles off and on over three years and about a third of the time stayed in people’s houses without ever asking anyone. When I first bartered for a room as a poet, in 1996, described in Twenty Days on Route 20, I felt a bit like Vachel Lindsay. Nearly 20 years later I still carry on the bartering. There are a few certain places though that I do have on my list of definite stops: City Lights Books, Robinson Jeffers’ Tor House in Carmel, the Grand Canyon. I’ll definitely be stopping at other National Parks and places of interest, but again, more spontaneously. I don’t like to have things too planned out. Will you be traveling alone throughout the entire trip? Can you describe your route for us? Yes, a solo journey, unless I pick up a hitchhiker. Hardly ever see any nowadays. The whole journey will be behind the wheel of my old, 1993 Honda Accord sedan. I started with New England then the upper mid-Atlantic states. From there, west through the upper Great Lakes states, the northern plains, northern mountain states, Pacific northwest, then down to California, the southwest and lower mountain states, then weaving back east through south central states, Gulf coast then north from Florida back to NY. My first reading was at my spiritual home, Acadia National Park in Maine. My final reading is in Corning, NY on my 63rd birthday, November 17. I find your triangle base that you talk about on the Foothills web site very interesting. Can you describe it? What have you learned about it during your trip and what else do you think you might learn as the journey lengthens? Interesting in how they intersect. The poems (creative side) come from my interactions with the other two sides of the triangle, people and nature. Again, there’s no separation for me between the poetry and the life. All of one piece. As far as this journey, I’m trying to keep the triangle in as much balance as possible. Mostly the side I need to work on is the nature end of it. The poetry and the people are happening just because of the nature of this 48 state reading tour. I need to work and getting enough time for myself outdoors. That will come more out west I believe and I will be camping a bit along the way. As far as what I think I might learn? I don’t know. I try not to have expectations in life, try to be present as much as possible. Ask me again after the journey has been completed! Dawn Leas is the author of the chapbook, I Know When to Keep Quiet (Finishing Line Press), and is the associate director of the Wilkes University M.A./M.F.A. Creative Writing Programs. Her work has appeared in San Pedro River River, Connecticut River Review, Literary Mama, Interstice and elsewhere. Her web site is www.dawnleas.com. Follow her @DawnLeas on Twitter.